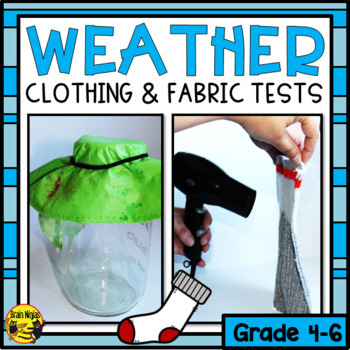 Your students can do five different experiments to test various types of fabric to see which would be best for specific weather conditions. 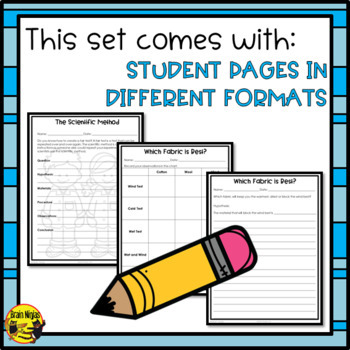 This product includes instructions so the experiments can be done by students independently or by demonstrations and comes in several variations for students to record their results. Options to differentiate for your class are integrated throughout the plans. Once the experiments are complete, students will use their knowledge to make critical thinking decisions in a few different extension activities that require students to take what they have learned to research Indigenous shelters or to design a tent. 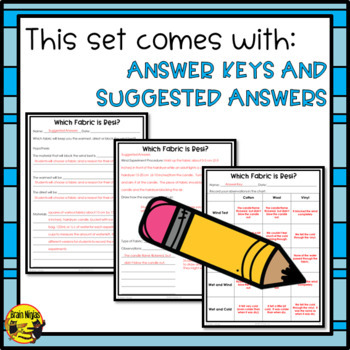 This product has been classroom tested with several groups of different fifth grade students and they really enjoyed the hands on aspects of the experiments. 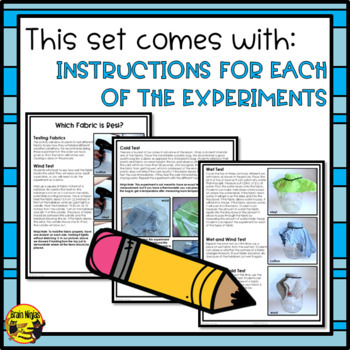 To complete the experiments you will need a hairdryer, glass jars, candles, and some fabric to test (we used an old wool sock, a old vinyl tablecloth and a cotton shirt). Thank you for your consideration! Happy experimenting from the Brain Ninjas!